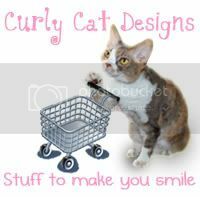 Daisy the Curly Cat: LIVESTRONG Day! I am wearing yellow today to support LIVESTRONG day! This October 2, LIVESTRONG is trying make sure that—on every street and every trail, they’re letting the world know that they’re ready to beat this disease. They want to turn some heads and join the fight against cancer by wearing yellow on LIVESTRONG Day. I am wearing yellow to help show my support and to raise awareness of the 28 million people living with cancer worldwide. I hope there will be a cure in my lifetime. We hope so too, Miss D. Yellow is definately your colour. Thank you from our hearts for supporting LIVESTRONG day by wearing yellow. That would be great, to see a cancer cure in our lifetime (meaning cat years!). 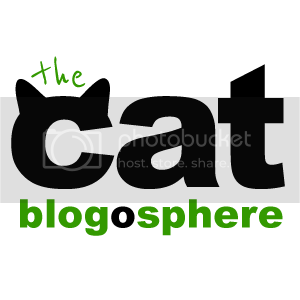 Imagine what that would mean for future generations of cats and humans! We too hope that soon Cancer will be ancient history. Yellow brings out your beautiful eyes Daisy! We hope they find a cure too Daisy! You look good in yellow, Daisy! Nice post, Daisy -- it would be wonderful to find a cure...and soon! p.s. you look simply dazzling in yellow, missy! You are looking good Miss Daisy in your yellow hoodie. We sure hope everyone livesstrong and wins the battle of the disease. We also hope there will be a cure very soon. You look great in yellow Daisy. I hope for a cure for cancer soon too. Lookin' good in yellow Daisy! Thanks for posting today! thanks daisy! i will too honey! We hope we see an end to this terrible disease too, Daisy! LiveStrong! Hi Daisy... and we suspect every sweet, little, teeny-tiny curl hiding under that rainbonnet is tipped with yellow 'n' gold! We hope there will be a cure for cancer soon so no human or animal has to suffer. 28 million is a very big number, isn't it? 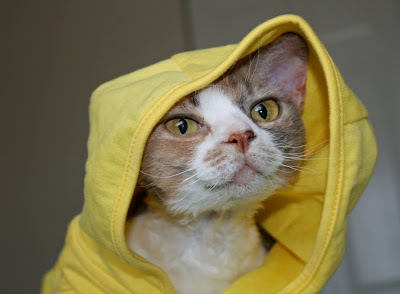 You look adorable in your yellow hoodie! Purrs, Daisy, you look great in yellow. We hope we'll see a cure for cancer in our lifetimes too. Mummy thinks you look very cute in your yellow top. We're proud to be doing our part today. LiveStrong! You look great in yellow!! Thanks for supporting Live Strong Day! We MUST LiveStrong for us and for those who have fought the good fight and lost to this miserable disease. Today we honor those who have lost their battle, those who are fighting their battle and those who have fought and won! They are all our HEROES! Today we stand tall with all of the LiveStrong participants. Together we WILL find a cure in our lifetime! Yellow looks good on you. We join U in hoping there will be a cure in our lifetime. Daisy, you look good in any color, but yellow is just purrfect today! We also purr for a cure for cancer!!!! Our post is up with the story of our dad's journey. We hope there's a cure in our lifetime too, Daisy. We're sending purrs, healing Light and universal Blessings to All Beings who have been affected by this terrible disease. We certainly hope were find cures for cancer. Thoughts for those who are struggling with it or who have lost their lives. Daisy, you look good in yellow. Miss Daisy, never has a yellow hoodie looked so good. We also hope there is a cure in your lifetime - that would be most excellent. We hope there will be a cure in our lifetime too Daisy! You look pretty in yellow. 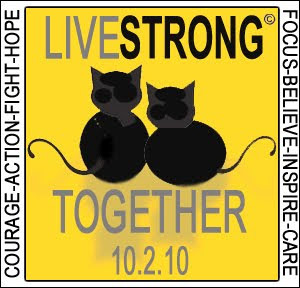 Let's Livestrong and Lovestrong too! Together we all show our support in making cancer awareness today. Too many lives have been lost. Hopefully some day cancer will be something of the past never to worry about again. You are adorable in yellow Daisy :) We are also purring for a cure. Livestrong! 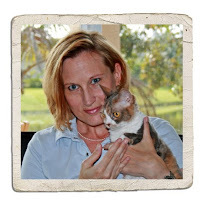 Purrs that they find ways to discover it faster and help people and furries survive it. Daisy, you look as sweet as a buttercup. I know you will live a good, long life, so I'm sure you WILL see cancer cured in your lifetime. We honour those who have survived cancer, and remember with sadness those who didn't. You look great in yellow, Daisy! I hope they can soon find a cure to cancer too!! we hope there is a cure soon too. and by the way, you look great in yellow. We hope there's a cure soon soon soon! And you look very fetching in yellow! In visiting all the beautiful LiveStrong posts there are to many In Honor Of and to many In Memory Of. We also hopefully and prayerfully hope there will be a cure sometime soon. Daisy you look really cool in your yellow hood. I was proud of Mom, she didn't forget to wear yellow yesterday.